This 2 pack of ultra-thin full cover curved tempered glass screen protectors for the iPhone X from Olixar offers superior toughness, visibility and sensitivity. Also comes complete with an installation tray for a quick, simple application. With the help of the applicator it was very easy to apply the protector, it fit perfectly. 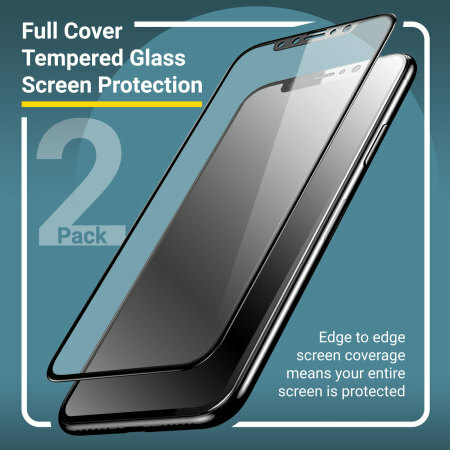 The quality of the protecter is very good, I’ve had it for a couple of months now and so far no cracks and I do drop it a lot so that says something. Bargain price really as you get two protectors and all the equipment needed to easily apply it. I did get a few bubbles when applying but they were quite easy to get rid of with applying pressure with the dust cloth. This screen cover provides great protection to you phones screen, with its bevelled edge it makes your iPhone look stand out. We all know the potential pain of installing screen protectors - so many things could potentially go wrong. Even the most nimble-fingered of people can struggle with complex installation processes. 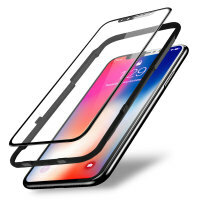 Not so with this Olixar screen protector twin pack, though, which comes with a perfectly form-fitting installation tray. 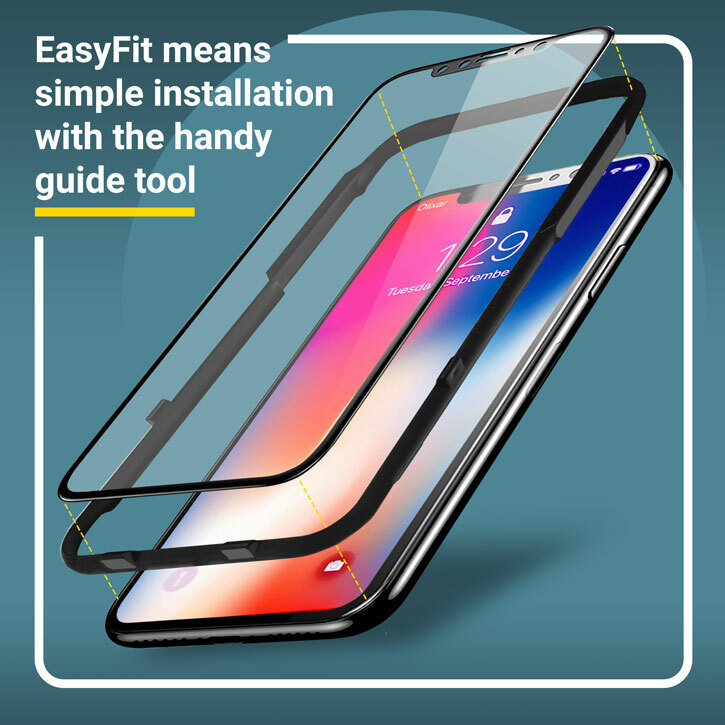 Simply slot your device into the guide tray and install the screen protector - no fuss, no mess. Screen protectors can be tricky beasts. There are lots of reasons why you might need a second one - in case your first one breaks or your hand slips during installation, for example. This twin pack from Olixar represents excellent value for money and stellar functionality - not only are you getting two screen protectors for an amazing price, but this means double the protection and double the peace of mind, too! Crafted with tempered glass technology inside, the Olixar Tempered Glass Screen Protector for the iPhone X provides you with a shatterproof design that guards your precious display from accidental bangs and drops. Despite offering great screen protection for your iPhone X, the glass is incredibly thin. This means it only adds an almost imperceptible amount of extra thickness to your phone, so you can be sure it is safe from harm while looking as good as new. 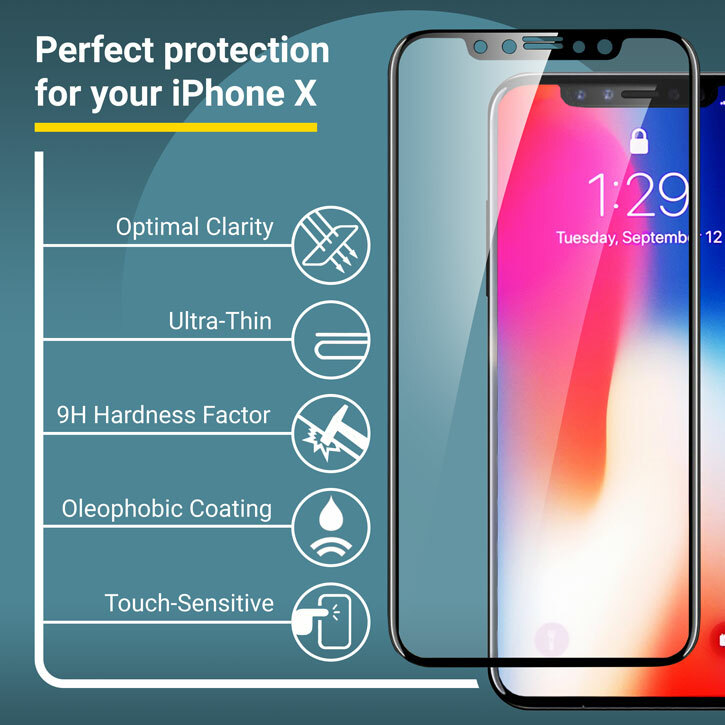 Designed specifically for the iPhone X, the Olixar tempered glass screen protector offers a protective fit for your device.